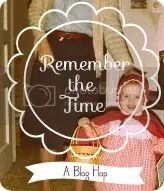 The Admittal: The last post I wrote was a week ago, and it was a recipe post. I have a confession to make: when I do recipe posts, it is because I’m being lazy. They’re easy and I can knock them out in about an hour and they boost traffic. The four posts prior to that one were essentially travel posts, which kind of write themselves too. So I’ve been slacking. 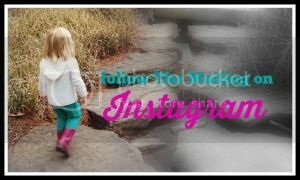 Sorry :,( This is as much an apology to my readers as it is to myself because I rely on my blog to sort through all the nitty-gritty of my pregnancy, which at this point is the main focus of my entire life. The Reasons: There are several. First, B is on Spring Break and he’s kind of been monopolizing the compy with his Tumblr, which he creates all new material for every day. He is no reblogger. And I hate blogging from the Ipad. Also, I’ve had so much baby-related stuff going on that by the end of the day, the idea of sorting through my thoughts on all of them here is overwhelming. I don’t know where to start. But today I’m going to try to start tackling it. Lastly, I’ve been busy cleaning. I dislike the term “nesting” because I’m difficult and enjoy taking issue with every pregnancy stereotype/norm I can find simply for the sake of being contrary. I’m just contentious like that. You can call it what you will, but in the past few days, I have mopped the entire apartment, put together a bookshelf, vacuumed the floorboards, cleaned the bathrooms with a toothbrush, and COOKED breakfast every morning. So, may the tackling begin! 2. Prepared Childbirth Class; or, as I like to call it, Confirmation of All Your Childbirth Fears Class. Either that or There’s Always Someone Crazier Than You Class. 3. The hospital tour we went on last night. I’m still trying to make some sense out of that one. 4. 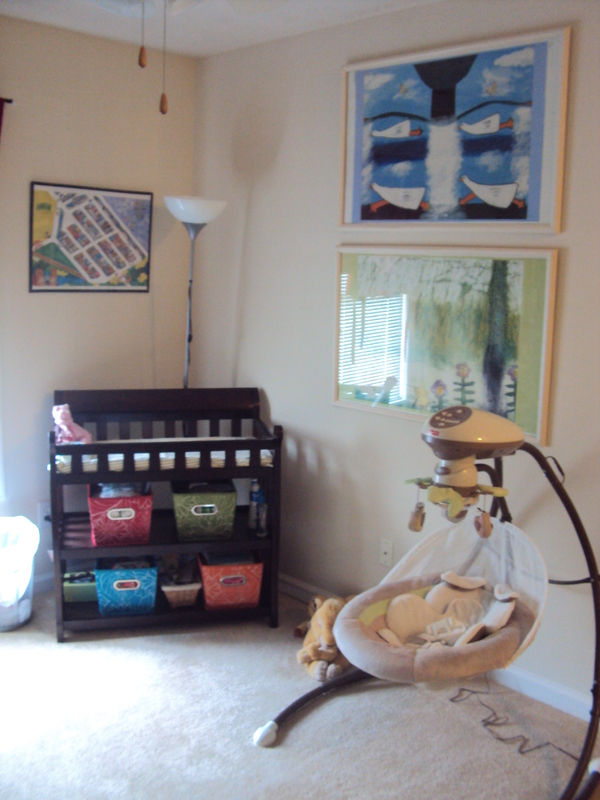 The COMPLETED nursery. Oh yes! It’s done, folks! I’m going to go ahead and laze-out on yet another post and go with Number Four. Her nursery is done and I am really happy with how it’s turned out. 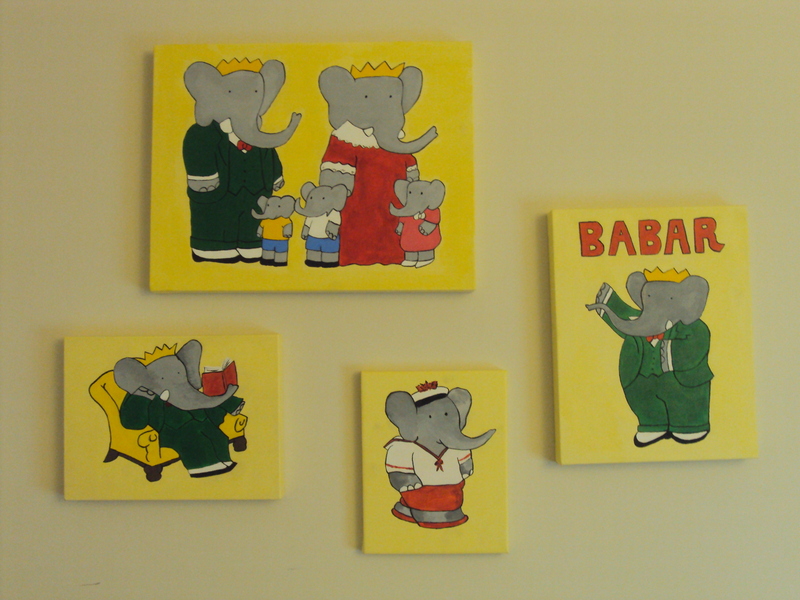 We went with a general Babar the Elephant theme for the room. 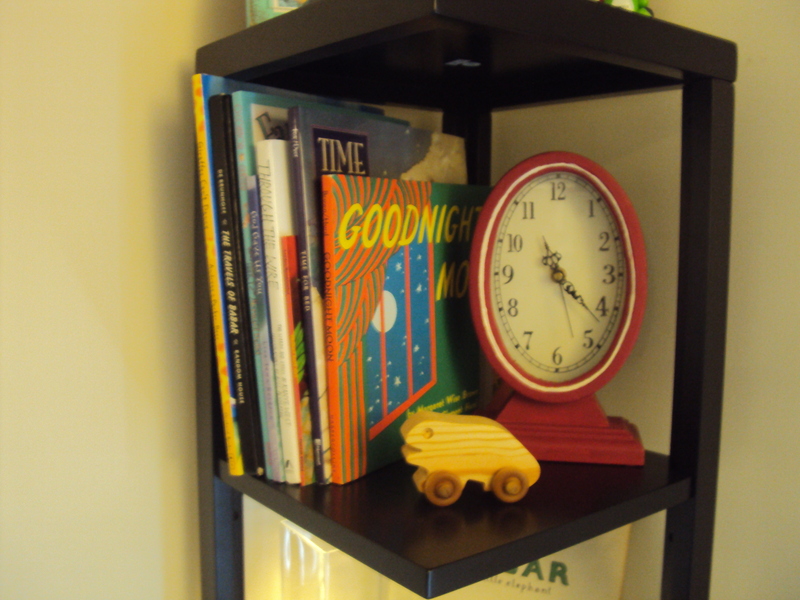 B has several antique Babar books that I got inspired by because of their primary colors. I integrated these older elements into the room but also created some new pieces as well. Her crib has sage green breathable “bumpers”, red gingham sheets, and a yellow gingham skirt. The decorative blanket is a gorgeous antique B’s mom Sidney passed on to us. I painted these WAY early in the pregnancy. There’s still one more that I’m working on, but I’m beginning to think it may not get done. The top picture is a scan from the cover of one of B’s antique Babar books. 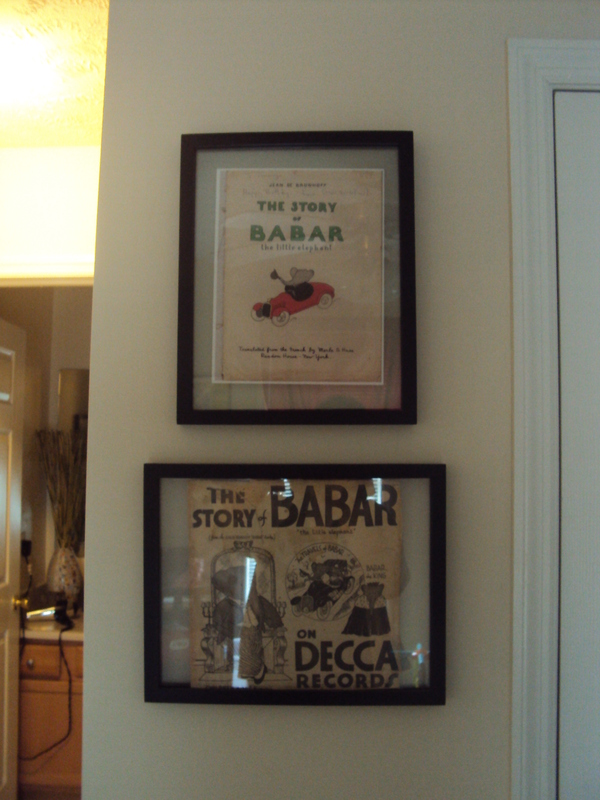 The bottom one is the record sleeve from a recording of Babar. Sidney passed it along to us too at Christmas after I told her we were planning on doing the whole Babar thing in the room. So cool! We didn’t buy really any new decorations for Bebe’s room. 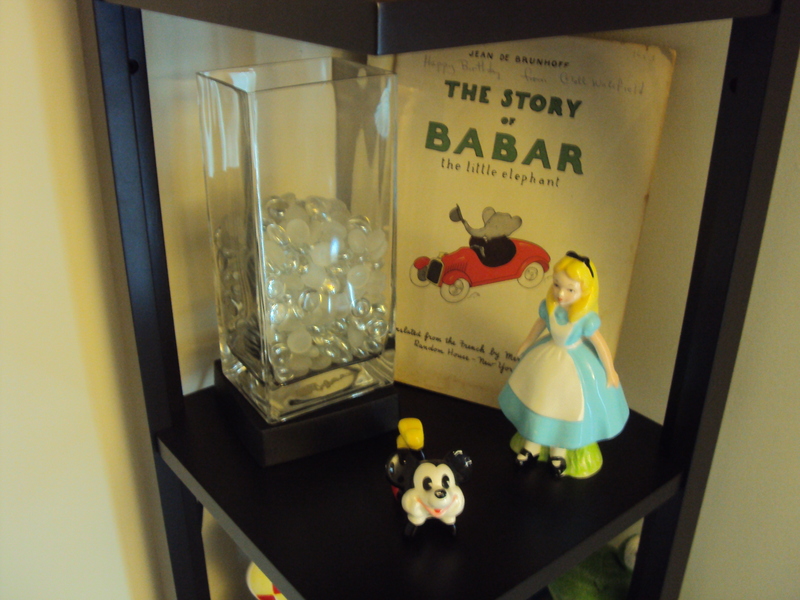 We’ve had the pebble glass light from Ikea for years, and the Disney figurines are mine from when I was a baby. The clock was given to us as a wedding gift, but while it was stored in a hot attic for the two years that we were in Korea, its wood finish was ruined. I just painted over it with red craft paint and now it fits quite well with the room. 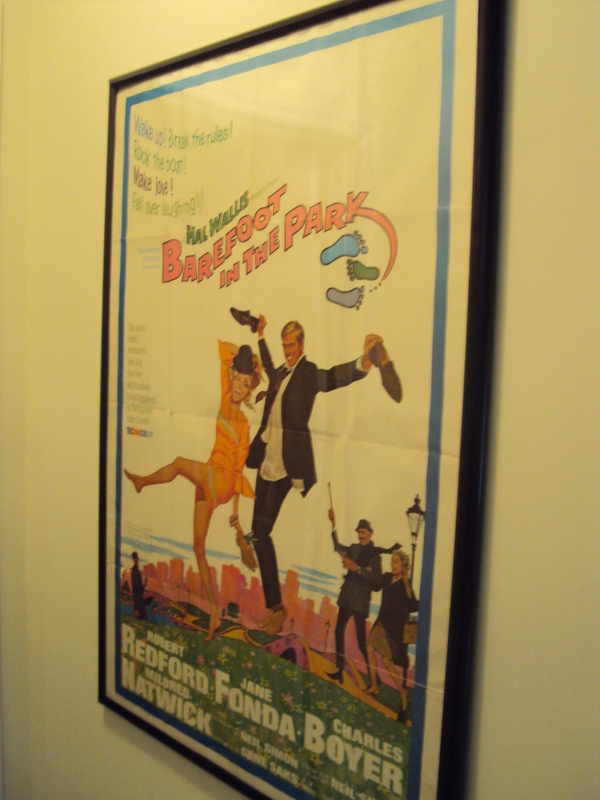 Sticking with the antique-ish art theme of the room is this old movie poster I got at an antique store when I was like eighteen years old. It is actually in really bad shape, but putting it in a frame that I got at Michael’s for only $30 makes it look a whole lot better. The posters we have hanging on the other wall are from a little print shop we loved in Insadong in Seoul. It’s hard to tell from the glare on these pictures, but they have ducks on them. I’ve had the frames for them for years, so this was another free decoration. 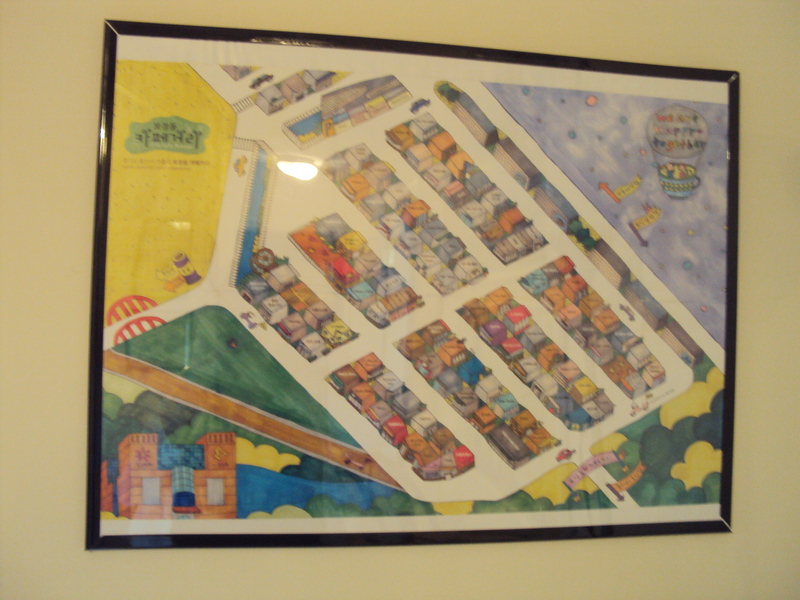 The smaller poster hanging over the changing table is a promotional brochure with a map of Cafe Street where we lived in Korea. It’s an awesome little piece of nostalgia. The frame was only $8 from Target, so I’d say it was a deal. We didn’t really feel the need to get a rocker for her room because there is a huge sofa right outside her room in the living room, and we were already pressed for space. 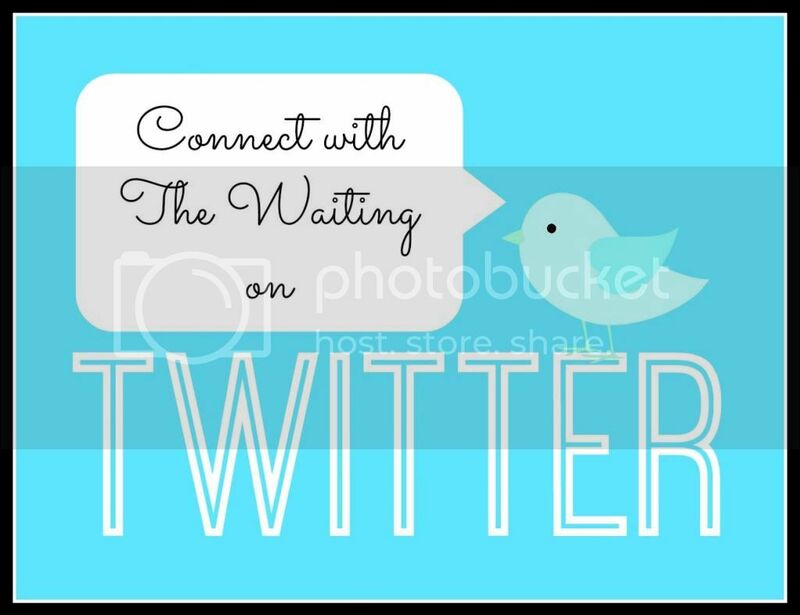 Please let me know in your comments which aforementioned topic I should lunge into next. I aim to please. So cute. What unique and adorable elements you put together. Thanks. I like hanging out in there already. Yay! 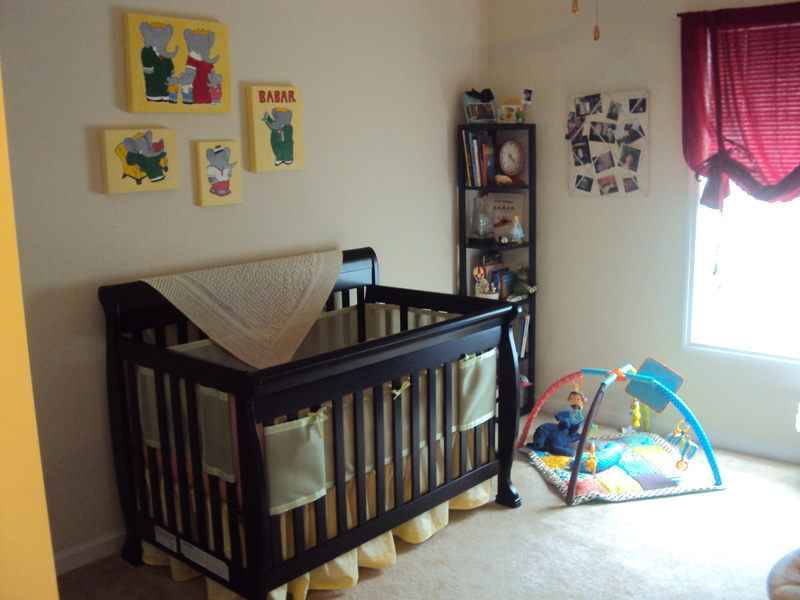 The nursery looks so awesome! I am happy to see the lovely paintings:) I don’t know, I am really curious to hear what the crazy haircut lady said, but I am also interested in the childbirth class! Bring on the stories! Love you! Thanks! Did you see the play mat? So cute! I love the nursery! Such a great theme! I vote unsolicited advise from the crazy haircut lady. Thank you! It’s really the only room in the apartment I feel that I like 100%. Babar rocks! So does Margaret Wise Brown. Rockers only keep YOU awake at night…Your nursery is SO ready! Thanks! We keep joking that despite the fact that it’s the most relaxing room in the place, we’ll likely spend very little time in there at first because her bassinet is in our room. Oh well, it’ll just have to remain the yoga room for awhile longer. Oh, my goodness! It’s so, so adorable, without screaming BABY BABY BABY. Change out the crib and I’d probably sleep in there. That’s a really nice compliment because that’s EXACTLY what I was going for! Hopefully some of the decor will transition well as she grows; *hopefully* she’ll like elephants as much as we do! Number 1! PLEASE number 1! I love the paintings of Babar. Thanks :) You got it. Super adorable! I love it! I wish that we were going to be able to put together a nursery right now, but we will have to make do but I love looking at pictures of what everyone is doing, theme-wise. LOVE! That swing is too cute! I think after she outgrows it I am going to have to find a new use for it so as not to have to part with it. Possibly a pending mail holder? I know! I love it too! Hmmm…I think it would also work to hold fruit. So many possibilities! What a beautiful room ! Thank you! Excited to try it out soon! Did you ever get the red velvet cake recipe I sent you a while back? The nursery is wonderful. It has a peaceful feel. I dig all the vintage-y stuff. And those paintings you did are pretty flipping awesome. And yes, it’s a week after you wrote it and I’m just now getting around to reading it. You’re not the only one who’s been slacking on stuff. Some of us more so than others.